Thank you Monmouth Arts for honoring us with the 2018 Community Arts Education Organization Award in honor of our outstanding commitment to arts education. Thank you Source Foundation at Red Bank Regional High School for honoring us with the 2017-18 Outstanding Service Award. Writing transforms lives, not only through the experience of writing itself, but also through the power of sharing our words and stories with others. Project Write Now is a nonprofit organization offering a range of writing workshops to children, teens, and adults in our studio, located in Red Bank, N.J. In our courses, we focus on the craft of writing, exploring such narrative techniques as characterization, voice, dialogue, and structure, while also providing a safe, supportive environment to experiment and take risks. Support our Literacy Outreach Program & After-School Writing Studio. 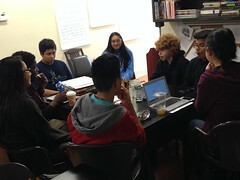 In addition to partnering with schools and mission-based organizations to offer writing workshops and services, we also created an exciting, dynamic after-school writing studio for local students. For more information on any of our programs, call 908.675.0467 or email info@projectwritenow.org. Project Write Now is a 501(c)(3) nonprofit organization transforming individuals, organizations, and communities through writing. By taking a class, you help support our community programs. PWN: What do you love about filling up journal pages with ink? LISA: There’s something deeply satisfying about filling a page and triple-so about filling a notebook. It feels gratifying, like a job-well-done. Have you ever gone grocery shopping and crossed off each item as you found it? It’s kind of like that, but bigger and more meaningful. You’re not just putting things in a cart to feed your body, but you’re putting words and art on a page to feed your brain, your imagination, your creativity. It’s grocery shopping but for soul food. PWN: What’s your go-to doodle? LISA: Although I love cats, the images I draw most often are not feline-related. I tend to doodle more floral designs—daisies, roses, lilies. I like drawing them because there’s so much freedom in the way they appear. For instance, daisies have a very different shape than roses. And tulips are often bright pinks and purples while hydrangeas are often pastel. There are so many variations of flowers, so it’s easy to put your own spin on what a flower could look like. I also love images that can be used to fill in gaps (I rarely leave room for white space) such as spiderwebs, eyes, bubbles. And lots of barren trees. PWN: What moment in the classroom gets you excited as an instructor? PWN: Why do you write and draw together? LISA: It has always been my understanding that art feeds art. Especially in writing. As writers, we repeat “show don’t tell”—and what is a drawing but a visual representation of a story? I’ve been art journaling most of my life—long before I knew it was called “art journaling.” I still have pages and pages from my high school years where I would both draw and write together. (Sometimes I even bring in old notebooks to show my students.) The first stories I ever wrote were told through drawings, and still, later in life, drawings have helped me express what words can’t always nail down. So I encourage my students to explore their creativity much the same way. We spend time writing, yes, but we also spend time drawing, painting, cutting up magazines, and listening to and learning from one another. It’s incredible to see my students light up when they realize they’re allowed to draw instead of write, or to spend time coloring in the corners of their pages, or to use different mediums like chalk or pastel. Imagine how much you can express when you break down the barriers that box in your art. We have also developed an after-school writing program at our studio in Red Bank. Come join us in our efforts to nurture young voices, develop their writing skills, and build confidence that touches all areas of their lives. *Qualifying schools may receive these services for free.